Glory to God in the highest, and on earth peace, goodwill toward men. So sang the angels on that first Christmas morning, and images of them, and their message, will appear on a million Christmas cards, usually in the form of gilded manuscripts or Renaissance paintings, or lurid females in the Pre-Raphaelite manner. 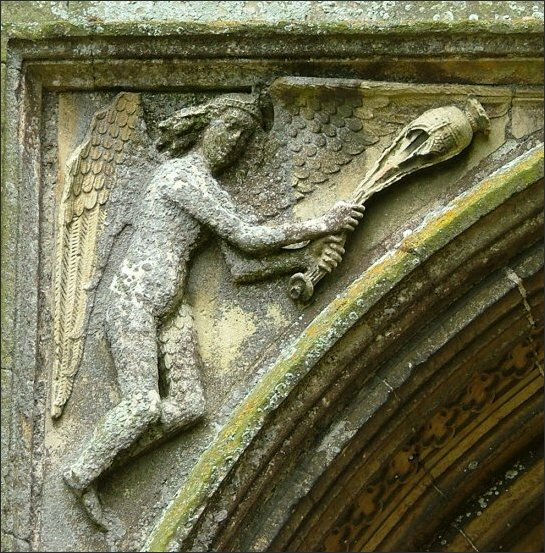 That mediaeval manual of church lore The Golden Legend, put angels firmly in their place, mid-way between man and God. Man understood that though angels are our keepers, our ministers, our brethren and our neighbours, they were also the bearers of our souls into heaven and representers of our prayers unto God, right noble knights of the King of Heaven, who dwell in the royal hall, accompanying the King of Kings and singing songs of gladness to his honour and glory. 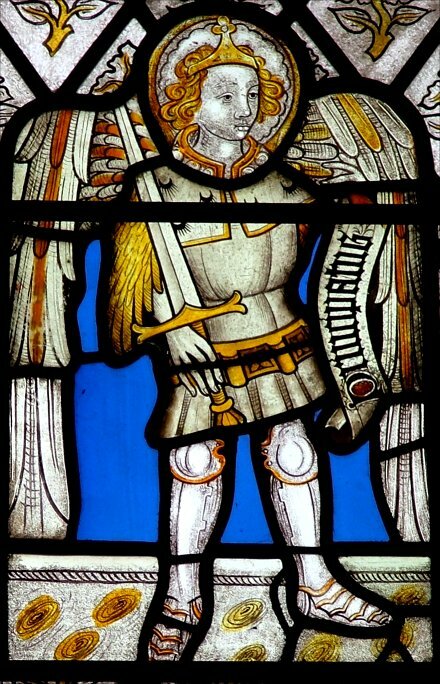 It is no wonder, then, that angels had such an important place in the decoration of our mediaeval churches, or indeed that nearly seven hundred churches in England were dedicated to St. Michael and All Angels. Look upward at the timber roofs at Knapton, Swaffham or Cawston in Norfolk, March in Cambridgeshire or Woolpit or Blythburgh in Suffolk, and the angelic host flutters overhead in its multitudes, 160 figures at Knapton alone: angels with spread wings on the wall-plates, angels standing against the hammer-beams and on the bosses. Their groupings suggest that the designers, whoever they were, wished to present a structure not only of craftsmanship, but of worship also. The hierarchy of the angels, Seraphim, Cherubim and Thrones, Dominions, Virtues and Powers, Principalities, Archangels and Angels, dating back to the sixth century and gleaned from various biblical sources, including St. Pauls list of supernatural beings, is strictly adhered to, as it is on the screen at Barton Turf. In sculpture, some of the most moving carvings are the flying angels high up on the walls at Bradford on Avon (Wiltshire), probably carved in connection with a Saxon Rood which no longer exists. 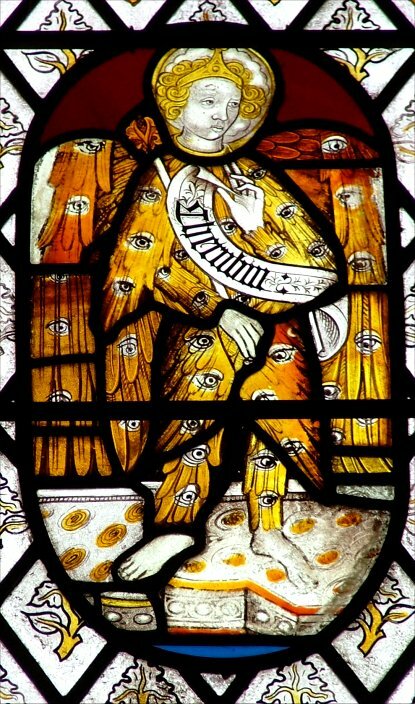 At Rowlestone, in Herefordshire, four angels fly upside down supporting the figure of Christ in Majesty and at Salle, in Norfolk, feathered figures with censers appear on either side of the west door.. 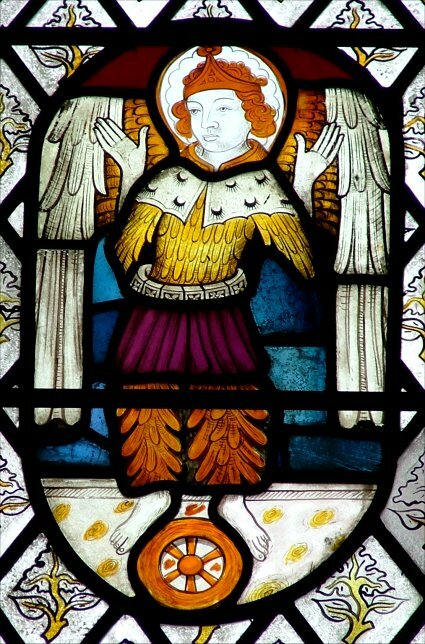 The feathers have the appearance of a tightly fitting garment, cut low around the neck, whilst the sleeves end loosely above the elbows, and the legs are bare below the knees. Less well known is the carved angel orchestra on either side of the Annunciation on the sumptuous porch at Pulham St. Mary - one side for the wind and one for the strings. Inside the church angels are everywhere. 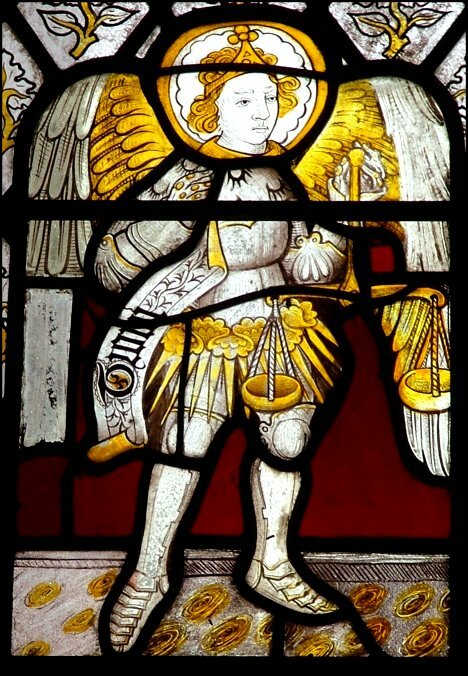 The wonderful angel roofs of East Anglia have already been mentioned, but we find angels adorning fonts, bench-ends, screens and windows. Often they are shown just from the waist up, known as demi-angels, and might support the bowl of an elaborately carved font, as at Upton, or peer out from behind the figures of saints, as at Litcham. Sometimes they are given pride of place to themselves, as above the main figures adorning the side altars at Ranworth. 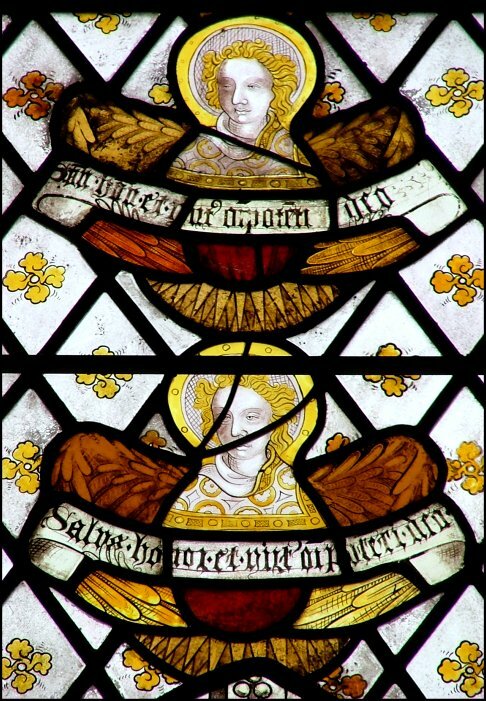 Angels occur over and over again in ancient glass, often carrying inscribed scrolls, displaying the Te Deum, the Nunc Dimittis or Gloria in excelsis. In churches dedicated to the Virgin Mary, Marian antiphons are common: Salve Regina or Ave Regina caelorum. 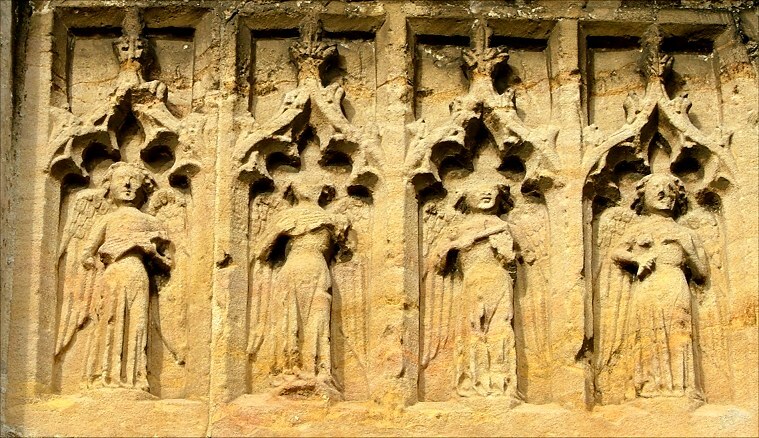 Some carry shields, and are often carved on the side of tombs, but the most common accessory of these mediaeval angels seems to be musical instruments. Paintings, carving or stained glass, music seems to be everywhere, and the angelic orchestra contains the harp, the viol, the organ, the lute (in various forms,) bagpipes, cymbals, tambours - the list is endless, and conforms fairly strictly with Psalm 150: Praise him with the sound of the trumpet; praise him with the psaltery and harp. Little remains in situ, but there are excellent figures at Cawston and Bale, and two particularly well preserved examples at East Barsham, one playing the harp and one the cornetto, where the mouthpiece is carefully depicted. 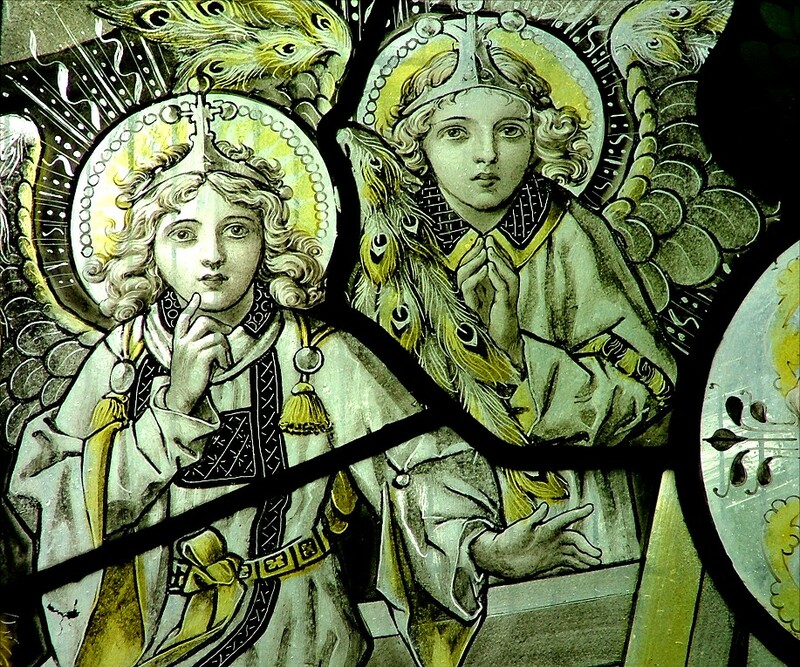 There are countless angels in sentimental Victorian windows, but the extraordinary church at Booton has a fine all-girl orchestra, whilst the angels in the Resurrection window at Walsoken have a timeless beauty. There is a legend that Palestrina composed his Missa Papae Marcelli under the direct influence of an angelic host. Improbable, no doubt, but just look up at the Angel Choir at Lincoln or the vault above the High Altar at Gloucester, or gaze in amazement at those hammer-beam roofs in East Anglia and hear in your mind the chorus of flying angels at the end of Mahlers Symphony of a Thousand or the serene angelic voices which close Berliozs Lenfance du Christ, music that emanates from Heaven alone, shared between oneself and ones maker, and in doing so you can capture some of the spirit and imagination of those incredible artists and craftsmen who lavished such skill on decorating our churches all those centuries ago.